Take a peek inside the latest issue of ImagineFX magazine - out now! 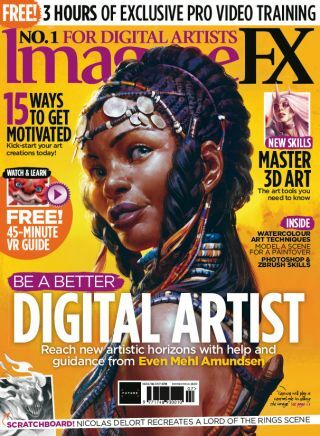 Professional artists share how 3D software can take your digital art to the next level in ImagineFX 162 - on sale now! Acting as a medium in itself or as a framework for other tools, 3D software have a range of creative possibilities. With concept and games artists possibly best suited to benefiting from 3D software, we talk to 5518 Studios to hear how they incorporated the tools into their workflow. Meanwhile in our in depth workshop we learn from Adam Dewhirst how to quickly work up a 3D concpet using ZBrush and Photoshop. Elsewhere in issue 162 we hear from Ara Kermanikian how to model a sci-fi composition model ready to be painted over. It's not all 3D fun though, as there are plenty of traditional art workshops to enjoy, including Nicolas Delort's pen tutorial which explores how to draw an iconic fantasy encounter. Topped off with all the latest news, reviews and reader art in our FXPose, you won't want to miss ImagineFX issue 162. Check out what's in store by taking a look over the lead features, below. Is 3D software the shortcut to a creative career? Or does it depend on which route you decide to take your art? We talk to artists who use 3D software in a variety of ways to find out how artists can benefit by adding technical wizardry to their artistic tool belt. When it comes to carving out a career as an artist, there can be moments when you have to take a leap into the unknown. That's just what happened to Pablo Carpio as he found himself with no job, no leads, but a lot of ambition. We talk to the artist to hear how he made it and ended up working on AAA games. An artistic funk can strike anyone at any level of their career. To help you out of your creative doldrums, Mel Milton is on hand to share his tried and tested motivational tips. Tackling everything from goals and challenges to dreaming big, this advice is sure to give your creativity a kick start. Artists with their finger on the pulse will be all too aware that the industry seems to be going through something of a VR renaissance. Thanks to easier access to powerful computers, more and more artists now have the chance to harness the possibilities of the VR medium. Glen Southern shows you how to sculpt a character for VR with this workshop. Thanks to its habit of running away with itself, watercolours have a bit of a reputation with artists. Kelly McKernan argues that this protean nature is something to be celebrated as she walks us through the basics of watercolour in this new core skills series.